A beatiful Irish wedding at Castello Vicchiomaggio, Tuscany. The smiling Irish couple Deborah and Colin have left the music choice in Guty & Simone very capable hands!! 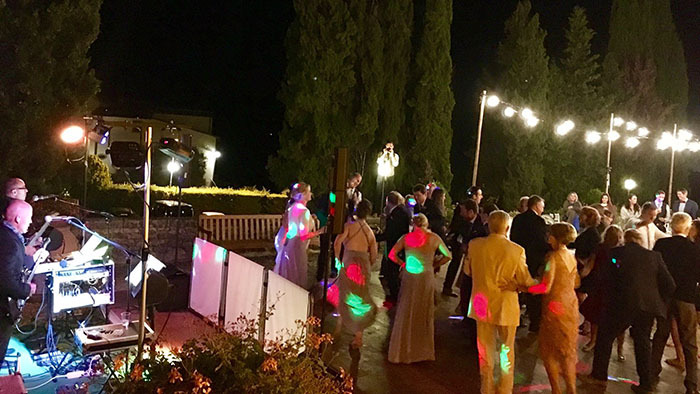 During the aperitifs the newlyweds asked a nice mix of classic well known Italian tunes, not too slow but nice upbeat tempo to get the celebrations started; during dinner a smooth background music and after dinner a mix of Rock’n roll and Disco music to fill the floor all the evening!! !After the live music they booked also a Guty & Simone DJset for the younger people and they and guests made all their R&B and EDM requests on the fly!!! Castello Vicchiomaggio (Via Vicchiomaggio 4, 50022 Greve in Chianti, Firenze, Italy) is located in the heart of the Chianti area, just halfway between Florence and Siena. Its location makes it an ideal place not only for a relaxing stay away from everyday life, but also as a starting point for exploring Tuscany, the famous artistic and architectural beauties of Florence and Siena and the fascinating and less known places like San Gimignano, Greve in Chianti, Monteriggioni, Volterra, Pisa and Crete Senesi. Let’s have a look to this amazing location!! !